The World's Most Compact Digital Video Cassette for Broadcasting. The ultracompact DVCPRO cassette is just 1/4 the overall size and 1/6 the weight of the standard 1/2-inch cassette tape used in news gathering, yet it offers twice the recording time — 66 minutes. This combination of smaller size and longer recording time means extra flexibility in the field. The DVCPRO generalpurpose cassette tape lineup also includes a tape with 184 minutes* of recording time for editing use. In both news gathering and editing, compact dimensions and extended recording time give DVCPRO cassette tapes a big edge in convenience. Smooth Tape Transport, Excellent Durability and Reliability. An ultra-flat base film and advanced calendering techniques give DVCPRO tape an ultra-smooth magnetic layer surface that eliminates spacing loss and micro-dropouts. This results in both low error rates and a higher C/N ratio, even in the high-frequency band. 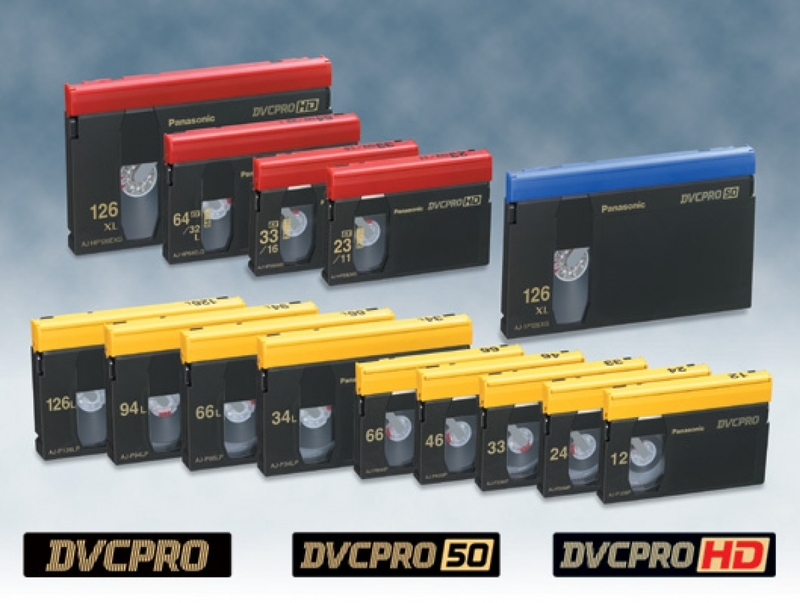 DVCPRO tape also features a new type of binder using a high-polymer that helps protect the magnetic layer and assure excellent durability, even with repeated usage and still playback. This means exceptional reliability in the most demanding environments and after long periods of storage. Durable Cassette Shell. A tough cassette shell and sealed structure assure durability and prevent entry of dust or other particles into the cassette. The cassette also features a reel-lock mechanism that prevents tape sagging and a slide-type eraseprevention mechanism to protect against mishaps. High Cost-Performance. High-quality DVCPRO metal tapes are more cost effective. Their smaller size can mean lower costs in other areas, too, thanks to their easy portability in the field and minimal storage requirements after editing. This all adds up to higher performance with lower operating costs.